The ever-changing Mancunian musical collective Homelife are launching their new album Exotic Interlude (out Oct 5 on Humble Soul) with a gig at Sacred Trinity on Friday. 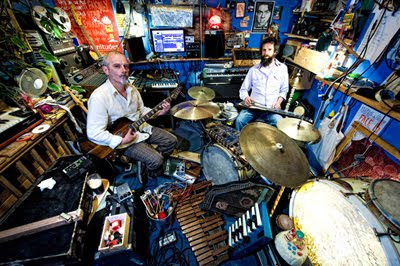 The band's latest incarnation has shrunk to founders Paddy Steer and Tony Burnside (pictured above). I've listened to the album and am really impressed with the new more mellow and folky sound emerging, but there's plenty there along the lines of their older sound, a ramshackle goody bag of surprising noise, tiki grooves and snatches of melody. This is sure to be a popular show as live Homelife appearances are rare as hen's teeth, so get in there. Manchester bloggers are invited to join Havana rum for a shindig to launch their Havana Cultura twitter campaign/new mix CD at Cord on October 8th, preceding a Havana club night at Odder, which they will take you along to. And yes, they're handing out some booty in the form of CDs, photo books, drink mixers and free rum. Yo ho ho! If you're a blogger who's interested in attending email Krista AT theneonhub dotcom. Any Manchester bloggers interested in covering the upcoming Conservative Party Conference should speedily contact Craig Elder (craig dot elder AT conservatives dot com) Don't think they'll be doling out free grog there, though. Oh, and in other digital gathering news, Social Media Cafe is back at The Northern, Tib Street on Tuesday October 6. FYI, I'm posting stuff like this here now but will likely move these blogger-relevant announcements over to the MCR Bloggers Facebook group, so sign up if you haven't already. The Food and Drink Festival is set to yummify Manchester October 1-11. This year brings a brand new independent wine festival, foodie hubs at St. Ann's and Albert Squares, and all manner of special meals, food tours, talks and cocktail hours. They have a shiny new website too. Go forth and nosh. At Urbis, 'Show & Tell' opens today and runs until Oct 12. It's an exhibition by the Urbis Creatives art collective. The exhibition will give the Urbis team a chance to show their work and tell the visitors about what they do outside of the creative environment of Urbis. It will comprise of many different disciplines from photography to illustration, painting and also projects the members are involved in such as community work and music events. For more information about the collective visit the website at www.urbiscreatives.org. In other art happenings, the big Angels of Anarchy: Women Artists and Surrealism exhibition has opened at Manchester Art Gallery. And the famously difficult to please Jonathan Jones has called it "magical. "Am going to this soon and will report back with a full review. Next month's Manchester Literature Festival has plenty of treats in store, and if you're willing to write reviews for their blog or help run their twitter feed you might be able to get to see some events for free. Last year's MLF blogging project was very popular and I'm happy to be helping organise it again. I'm really glad MLF has gotten behind this - it's great to see a Manchester cultural organisation making a serious effort to involve bloggers in what they do and engage with them in a more organised way instead of just banging out press releases. So this is the way it works: Bloggers can choose a few festival events they'd like to attend and write a review of for the MLF blog. MLF will then commission some bloggers to review an event or two in exchange for free admission. Bloggers will need to be able to write and send in the review relatively quickly after the event - the next day ideally. All reviews should be around 500 words in length and include relevant links. MLF will publish a link to the author's blog or website at the bottom of each review. MLF is also looking for an experienced blogger or two to edit these reviews and one or two people to help out with the festival's twitter feed or facebook account- both in exchange for free tickets to some events. If you're interested in any of these online endeavours you can find out all the details by coming along to a meeting next week. The main MLF Volunteer meeting is scheduled for Wed 16th, September (Yes that's tomorrow) 6 - 7.30pm in Committee Room (2nd Floor) of Manchester Central Library. Digital volunteers should show up at 6:45 as the last part of the meeting will deal with blogging and social media. 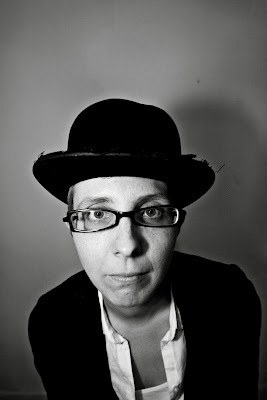 Please email admin AT manchesterliteraturefestival.co.uk to let them know you're coming and include the url of your blog. If you can't make the meeting but still want to get involved then just email the folks at MLF and let them know. It's Manchester Blog Awards nomination time, and I'm being deluged with new blogs to add to my blogroll. Seriously. 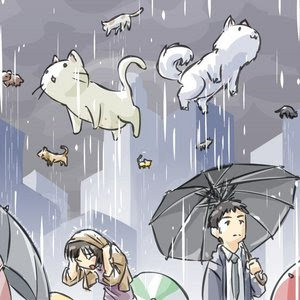 It's raining blogs, hallelujah. Like that. So I'm going to be briefer than normal and just list a whole bunch of new additions here, because, you know, there are about fifty more lined up behind them, and the baby could wake up at any time. Wondrous Reads - a really comprehensive YA/Teen fiction blog written by a bookstore employee from Stockport. Writer Richard Barrett has a new blog, Yawn. The long queue of people stretching out the doors of Manchester Cathedral last night was an encouraging spectacle. Margaret Atwood’s Year of the Flood evening was a sell-out, and whether people were there because they loved her writing, or because they thought it sounded like a good show, there was no cause for disappointment on either count. The Year of The Flood brings us back to the world Atwood introduced in Oryx and Crake, widely acknowledged as a masterwork of speculative fiction. It’s a world where most of the human race has been killed off by a pandemic; where the few people left scrabble for survival in a dystopian wasteland overrun with freakish genetically engineered animals and patrolled by the company soldiers of CorpSeCorps. Most of all, it’s a world where a homespun religious cult called God’s Gardeners farm rooftops and sing hymns about holy pollination, vegetarianism and the preservation of species. These hymns were set to music by California composer Orville Stoeber and they marked the beginning of the performance. You heard the singers before you saw them, filing slowly into the centre of the Cathedral bearing cardboard banners inked with images of endangered species such as the Natterjack Toad and Kingfisher. The singers, drawn from the Manchester Lesbian & Gay Chorus, Ordsall Acapella Singers and the Blackburn Community Choir, delivered Atwood’s hymns with their gentle melodies and simple harmonies in a straightforward and humble manner befitting God’s Gardeners. In order to reduce the size and carbon footprint of her traveling posse, Atwood is enlisting local performers in every city, making the presentation slightly different each time as well as engendering a kind of community ownership of the event. The change was refreshing; It couldn’t have felt less like the standard book tour dog-and-pony show. The real stars of the performance were the wonderfully talented and versatile actors who read the parts of main characters Adam One (Kevin Harvey), Toby (Samantha Giles) and Ren (Samantha Sidall.) They had a challenging task: the dramatic of reading of whole passages fully embodying their character while also filling in as several secondary characters. But they held the whole cathedral transfixed; the narrative spell was never broken. 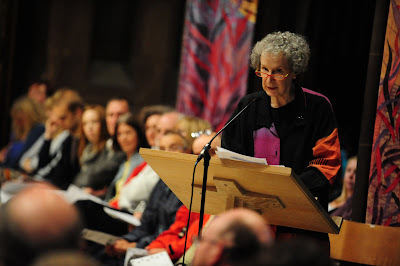 The readings were linked by Atwood’s elegant summaries of the background action, so the audience were able to understand the wider sweep of action in the book. Still, at evening’s end, when all were invited to stand and join in singing a farewell hymn, several questions remained tantalisingly unanswered. There can’t be many people there last night who won’t be seeking out The Year of The Flood sooner or later. I know I will. 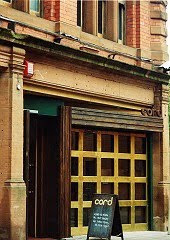 I've organised a long-overdue Manchester blogmeet for Thursday September 17, from 6-8pm at Cord, off Tib Street in the Northern Quarter. All are welcome... bloggers, friends of bloggers, blog readers, whatever; come on down to the basement. And for the first time this will be a sponsored affair. The folks from Creative Tourist, the web magazine of the Manchester Museums Consortium, will be buying everyone a drink and giving us a brief rundown of their goings-on. As nobody put forward any objections when I asked around a couple of months ago, I'm trying out this sponsorship model for future blogmeets. Seems there are quite a few organisations about who are interested in working with Manchester bloggers, so if they'd like to buy us a beer or a coffee I figure we're willing to listen to what they have to say for ten minutes or so. As ever, the rest of the time will be spent in making friends, catching up, flirting, frontin', bullshitting and otherwise interacting with other Manchester blogfolk. If you plan on coming say so in the comments, comment on the MCR Bloggers FB group message I'm about to write, or email me so we know how many to expect.